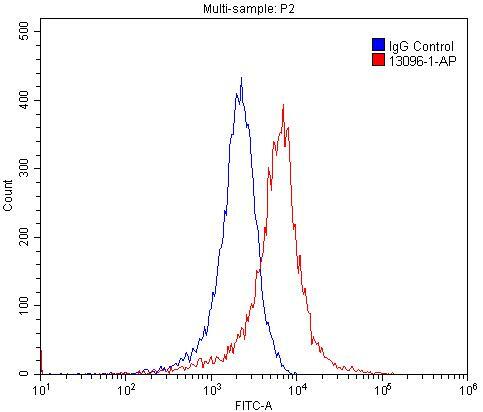 1X10^6 PC-3 cells were stained with 0.2ug ADRB2 antibody (13096-1-AP, red) and control antibody (blue). Fixed with 4% PFA blocked with 3% BSA (30 min). Alexa Fluor 488-conjugated AffiniPure Goat Anti-Rabbit IgG(H+L) with dilution 1:1500. Beta-2 adrenergic receptor (ADRB2), a member of the G protein-coupled receptor (GPCR) family, binds epinephrine with an approximately 30-fold greater affinity than it does norepinephrine. ADRB2 is directly linked to one of its final effectors, the class C L-type Ca2+ channel, Cav1.2 (PMID: 11441182). 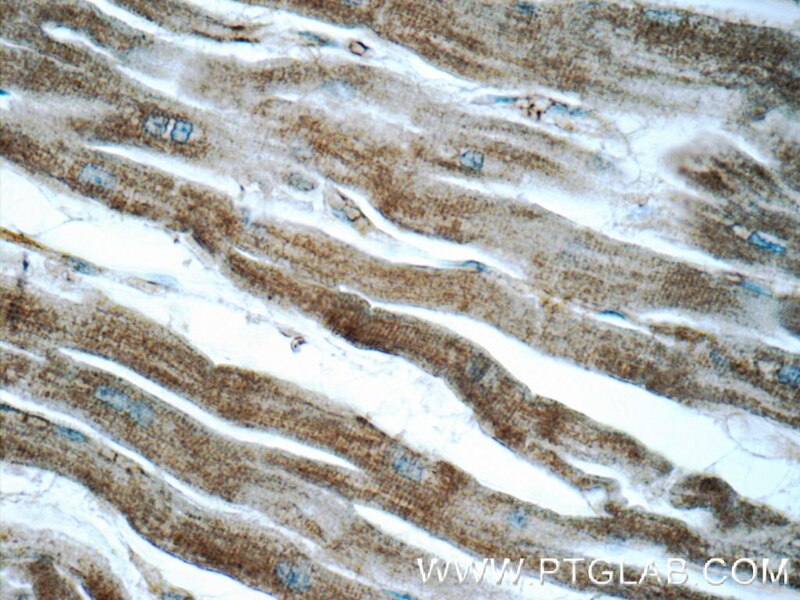 This receptor-channel complex also contains a G protein, an adenylyl cyclase, cyclic adenosine monophosphate- dependent protein kinase (PKA), and a counteracting phosphatase, PP2A. Different polymorphic forms, point mutations, and/or downregulation of the gene of ADRB2 are associated with nocturnal asthma, obesity and type 2 diabetes. 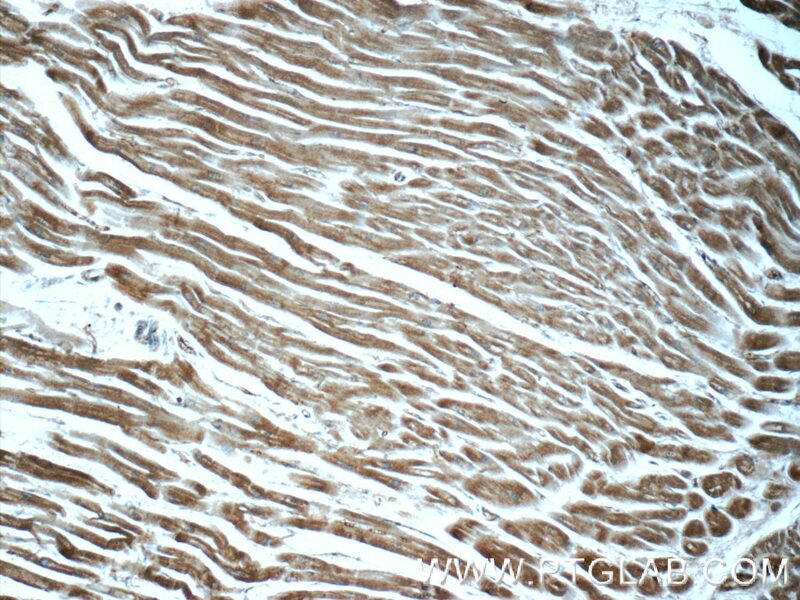 This antibody detects ADRB2 with an apparent molecular weight of 50-55 kDa as has been shown by some researches (PMID: 25348166; 12502786; 29232706; 23984976; 19584355). Astrocytic β2-adrenergic receptors mediate hippocampal long-term memory consolidation. Propranolol sensitizes thyroid cancer cells to cytotoxic effect of vemurafenib. Interplay between sympathetic nervous system and inflammation in aseptic loosening of hip joint replacement.